Production of modern geospatial data using UAV platforms of aerial photography. 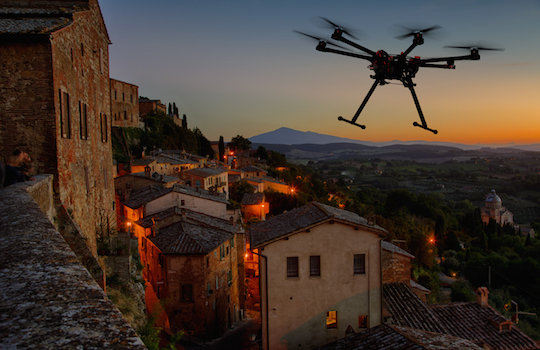 During the last decades, the use of photogrammetric systems of aerial photography have provided more flexibility, shorter delivery time and lower costs, resulting at the same time in deliverables of higher resolution and accuracy. Map successfully embraced this technology. To date, we have completed hundreds of hours in flight for the mapping and documentation of more than 60 communities, achieving an accuracy of up to 5cm. The resulting products consist of the full geometric documentation of the structures (planimetric and elevation surveys) with an accuracy of 10cm or better. The 3D city models generated were used by public authorities for the extraction of geospatial data, for the development of infrastructure projects. Map has at its disposal two SenseFly unmanned aerial vehicles for small area projects and two multicopters for use in point image capture and corridor mapping projects, with very high resolution and low altitude flight requirements. We actively use the best software for the processing of UAV imagery: PIX4Dmapper Pro of Pix4D, Agisoft and Acute3D. Our staff was trained by SenseFly, in Switzerland, in the effective use of the eBee and eXom platforms. We use original state-of-the-art Photogrammetry and Computer Vision methodologies and algorithms in order to deliver modern photogrammetric products (vector and imaging) from the massive amount of data captured by the UAVs. These products include dense 3D point clouds, 3D city models, terrain and surface models, true orthophotos and orthophotomosaics (RGB and hyperspectral) as well as 3D plans with automated, stereoscopic measurements. We automate improve continuously our processes and workflows to achieve better accuracy and processing time.